An original oil painting of a young woman, Mansi, performing a traditional South Indian dance called "Bharata Natyam". 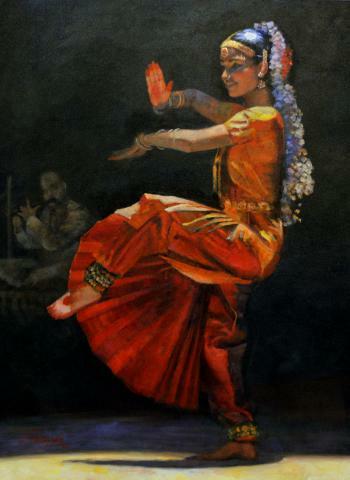 Her performance, accompanied by Carnatic music, is a sort of "graduation" performance, capping many years of practice. It lasts about two hours, as the dancer performs many hand, neck and eye movements, each with significant spiritual and cultural meanings. The elaborate and colorful costuming, with several changes throughout the performance, also has significant meaning, as the dancer wears a several ornaments of shining stones on neck, ears, hands, and head, jasmin garland in her hair and foot trinklets with small bells.